Qatari Armed Forces on Wednesday celebrated the 86th founding course at Duhailiat Training Camp under the patronage of Minister of State for Defense Affairs, HE Dr. Khalid bin Mohammad Al Attiyah and in presence of Chief of Colleges and Institutes Major General Hamad bin Ahmed Al Nuaimi, Qatar News Agency (QNA) reported. 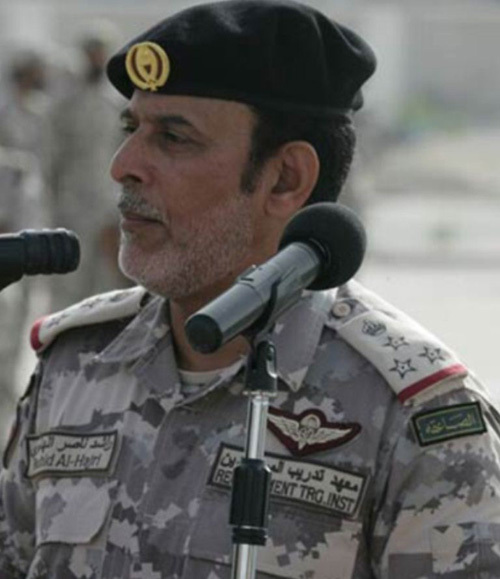 Commander of recruits’ training institute Brigadier Rashid bin Nasser Ali Al Fuhaid Al Hajri (photo) said in a statement issued by the Directorate of Moral Guidance in the Armed Forces that the achievement made by the Institute came as a result of the unlimited support of the Minister of State for Defense Affairs Dr. Khalid bin Mohammed Al Attiyah, and the Chief-of-Staff of the Armed Forces Lt. General (Pilot) Ghanem bin Shaheen Al Ghanim. He added that the institute is reaping the fruits of the educational process which comes in the implementation of the training plan for the armed forces, making it able and qualified to keep abreast of the developments witnessed by our armed forces at all levels. He pointed that the training institute will enter the next training season with new identity and motto to meet the aspirations of the armed forces, explaining that four sessions will be held in the next training season covering all the training needs of the new recruits. He urged the graduates to double their efforts in the service of their homeland.